The easiest part of the map creation process is obtaining your own Google Maps API key. This virtual key is literally your key to being able to view, test, and share your map creations with others. A Google Maps API key is completely free of charge, and is presumably required so that Google can keep close tabs on how its technology is being used. Keep in mind that Google Maps is technically still a beta product, which means that it is still under development. So in many ways you are playing the role of tester when using Google Maps. Anyway, getting back to the API key, you can sign up and obtain your key by visiting http://www.google.com/apis/maps/signup.html. This page requires you to enter the URL of the web site to which you plan on publishing your maps. A single API key gives you the ability to publish maps to one folder on one web server. As an example, if I register an API key for http://www.xyz.com/maps, I can only publish maps to the maps folder on my web server and nowhere else. Well, technically I can publish them wherever I want on my web server but they'll only work if I place them in the maps folder. Make sure you actually publish your maps to the URL you specify when obtaining your API key. The API key is provided to you as a long text code that you will cut and paste into your mapping code later. For now, copy and paste the code into a text file and save it for later. The API key is too long to fit on one, which is why you see it broken across multiple lines. In your HTML code, don't add any spaces or line breaks in the API key or it won't work. After placing the <script> tag in the head of a web page, you can begin calling API functions to create the map itself. Notice that the ID of the div element is map, which corresponds to the ID of the element passed into the GMap() function. This is how the map gets connected to a container element on the web page. The last step in creating a custom map is creating the markers on the map, which can also involve using custom icon images if you so choose. Custom icons in Google Maps actually consist of two images: the icon image and a shadow for the icon. You learn more about these images a bit later in the tutorial. For now, take a look at the following code, which shows how to create a marker with a custom icon, as well as how to set a listener function that opens an information window when the marker is clicked. The main things to note in this code are how the various icon sizes are specified, including the relative offset of the icon anchor and the information window anchor. These offsets determine how the marker icon image is positioned relative to the location on the map, as well as the offset of the information window with respect to the marker. The last two lines of code look messier than they truly areall they do is open an information window and display an XML element in it, while making sure that the element is coded using the styles.xsl stylesheet. The job of this stylesheet is to transform the XML description of a location on the map into HTML code that can be displayed in a browser. I realize I hit you pretty fast with the Google Maps API and code that puts it to work. Not to worry because you see all of this code again in the context of a real custom Google Maps web page. For now, I just wanted to lay the groundwork and start getting you comfortable with the script code required to get a custom map up and running. Although Google Maps is typically queried based upon the mailing address of a location, when you deal directly with the Google Maps API you are required to deal with more accurate location data. More specifically, you must specify the latitude and longitude of a location, also known as its geocoordinates, when specifying its position to the Google Maps API. Because you probably haven't committed to memory the latitude and longitude of your favorite hangouts, you'll likely need to use a tool to find out the coordinates of any address that you want to include on a map. Fortunately, exactly such a tool exists in the form of the geocoder.us web site, located at http://geocoder.us/. This web site allows you to enter an address much as you would enter it in Google Maps. Assuming the address is successfully found, geocoder displays the latitude and longitude of the address, which you can then use in Google Maps to specify the exact position of the location. 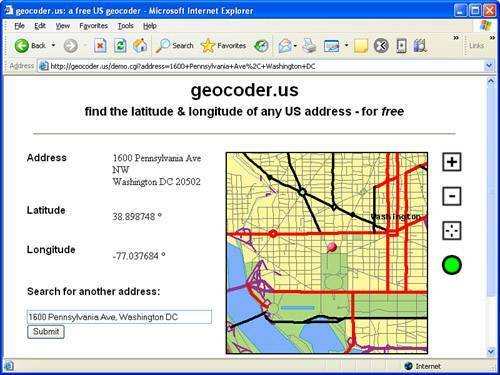 Figure 15.4 shows the geocoder online tool displaying the latitude and longitude of a well-known address. Figure 15.4. The geocoder.us web site is extremely handy for converting physical addresses to geocoordinates (latitude and longitude). If you happen to have a GPS receiver, you can also determine the latitude and longitude of any location using the receiver. Of course, you'll have to physically travel to the location so that its latitude and longitude are registered on your GPS device. The figure reveals the geocoordinates for the White House, which is located at 1600 Pennsylvania Avenue in Washington, DC. You can use the geocoder.us web site to look up any address that you want, keeping in mind that you can always cheat and use a nearby address if for some reason the address you're looking for isn't found. 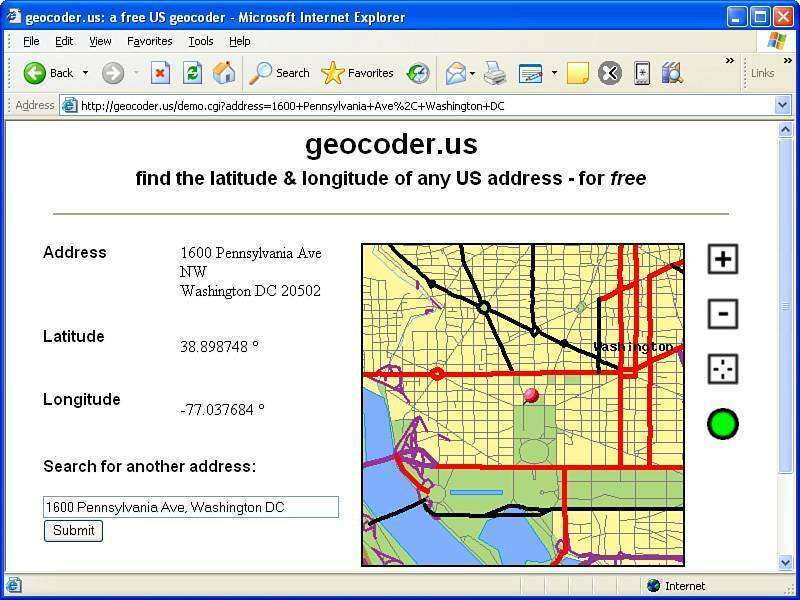 Later in this tutorial you'll use the latitude and longitude values displayed on the geocoder.us web site to fill in details regarding the locations of real estate projects in XML code.